AmeriTemp features Power Source Emergency Generators for the most demanding applications. Mobil, Indoor, Outdoor, Emergency, Rental, Spot, Industrial, We have these ranges of electric generators available:Units available from 10 kW, 20kW, 30kW, 60kW, 100kW, 150 kW to 400kW, 1,750 kW. Trailer mounted and Power distribution, Industrial Power for light towers, events. PowerSource units feature a control panel-mounter voltage selector switch (VSS) for easy setup of required voltages. PowerSource models have a safety shutdown system to prevent access to the VSS when the generator is operating, eliminating potential misuse of the VSS. 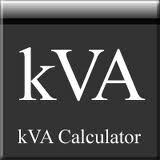 All units have a common, simple-to-use interface with operator-preferred analog controls. The advanced engine controller protects the generator system against faults. Remote auto start / stop control is a standard feature (except on G10), enabling connection to automatic transfer switches. Each PowerSource model features 110% environmental containment to prevent any spillage of fuel, oil, or coolant. All models utilize powerful alternators with AREP excitation, which give PowerSource best-in-class motor-starting performance and make these units ideal for powering applications with high startup demands. 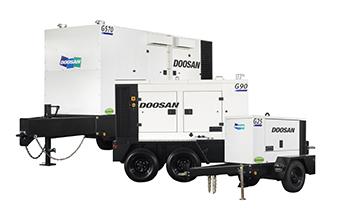 Our heavy-duty mobile system is integrated with the generator frame, providing a robust platform to withstand jobsite conditions and provide miles of trouble-free use. Standard DOT-approved road lights and heavy-duty fenders round out the toughest mobile system on the market. 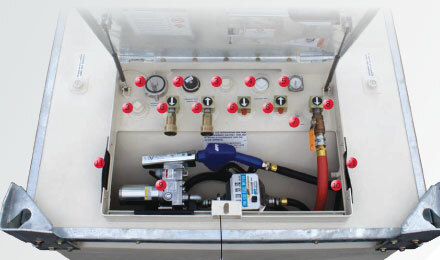 AmeriTemp includes fuel tanks to provide its rental customers a complete turnkey power system. 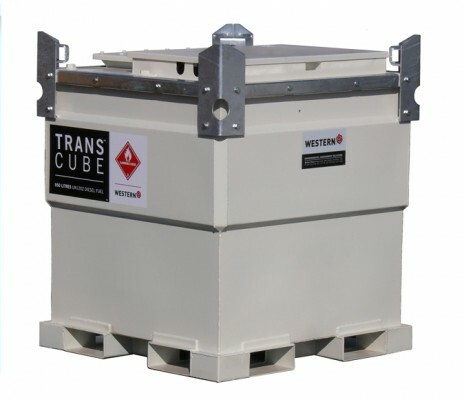 Western International has designed its Transcube tanks to be double walled, with an outer wall that offers 110% secondary containment of the total capacity of the inner fuel tank. All fill ports and connections are located within the secondary containment area to contain any fuel drips. 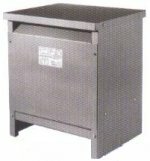 Click to Purchase Transcube Diesel Tanks. AmeriTemp has three 264-gallon Western Transcube Diesel Tanks and another three 528-gallon units in its fleet. The tanks have a more aesthetically pleasing look than traditional fuel tanks, which are usually round and often rusty. Transcubes are rectangular in shape, a unique design that makes the units more user-friendly. Click Here to Purchase Transcube Diesel Tanks Thank you for visiting the AmeriTemp Ltd. web site. Please fill out the following form with your questions or comments. G25 26 (21) 28 (22) 208 / 220 / 240 / 416 / 440 / 460 / 480 V Switchable 120 / 127 / 139 / 240 / 254 / 266 / 277 V Switchable 31 72 65 Ingersoll Rand 32 (24) 40 (151) 20.8 131" x 59.5" x 67"
G40 36 (29) 38 (30) 208 / 220 / 240 / 416 / 440 / 460 / 480 V Switchable 120 / 127 / 139 / 240 / 254 / 266 / 277 V Switchable 43 100 89 Ingersoll Rand 43 (32) 53 (201) 20.2 142.7" x 65.7" x 71.9"
G60 58 (46) 64 (51) 208 / 220 / 240 / 416 / 440 / 460 / 480 V Switchable 120 / 127 / 139 / 240 / 254 / 266 / 277 V Switchable 70 161 150 Ingersoll Rand 72 (54) 111 (420) 27.4 155.8" x 68.7" x 85.4"
G80 83 (66) 91 (73) 208 / 220 / 240 / 416 / 440 / 460 / 480 V Switchable 120 / 127 / 139 / 240 / 254 / 266 / 277 V Switchable 99 200 188 Ingersoll Rand 102 (76) 103 (390) 20.3 155.8" x 68.7" x 85.4"
G90 94 (75) 103 (82) 208 / 220 / 240 / 416 / 440 / 460 / 480 V Switchable 120 / 127 / 139 / 240 / 254 / 266 / 277 V Switchable 113 236 221 Ingersoll Rand 115 (86) 190 (719) 30 165.8" x 71.7" x 83.6"
G125 125 (100) 137 (110) 208 / 220 / 240 / 416 / 440 / 460 / 480 V Switchable 120 / 127 / 139 / 240 / 254 / 266 / 277 V Switchable 150 346 346 Ingersoll Rand 150 (112) 145 (549) 19.7 165.8" x 71.7" x 79.6"
G145 144 (115) 158 (126) 208 / 220 / 240 / 416 / 440 / 460 / 480 V Switchable 120 / 127 / 139 / 240 / 254 / 266 / 277 V Switchable 173 369 346 Ingersoll Rand 177 (161) 190 (719) 22 165.8" x 71.7" x 83.2"
G185 183 (146) 201 (161) 208 / 220 / 240 / 416 / 440 / 460 / 480 V Reconnectable 120 / 127 / 139 / 240 / 254 / 266 / 277 V Reconnectable 220 500 458 Ingersoll Rand 216 (173) 255 (965) 22.5 203.9" x 75.7" x 94.8"
G240 239 (191) 263 (210) 208 / 220 / 240 / 416 / 440 / 460 / 480 V Reconnectable 120 / 127 / 139 / 240 / 254 / 266 / 277 V Reconnectable 288 608 N / A Ingersoll Rand 286 (213) 255 (965) 18.9 203.9" x 75.7" x 94.8"
G290 290 (232) 319 (255) 208 / 220 / 240 / 416 / 440 / 460 / 480 V Reconnectable 120 / 127 / 139 / 240 / 254 / 266 / 277 V Reconnectable 349 805 N / A Cummins 352 (263) 390 (1476) 23.2 220.9" x 77.7" x114.4"
G450 456 (365) 502 (402) 208 / 220 / 240 / 416 / 440 / 460 / 480 V Reconnectable 120 / 127 / 139 / 240 / 254 / 266 / 277 V Reconnectable 548 1,260 N / A Cummins 555 (414) 579 (2192) 21.3 260.9" x 85.9" x 119.8"
G570 570 (456) 627 (502) 208 / 220 / 240 / 416 / 440 / 460 / 480 V Reconnectable 120 / 127 / 139 / 240 / 254 / 266 / 277 V Reconnectable 686 1,416 N / A Cummins 680 (507) 579 (2192) 18.6 260.9" x 85.9" x 119.8"